While we often picture astronomers as lone souls peering through a telescope, building, carrying out, and analyzing an ambitious survey such as DES requires a large, coordinated team. DES is an international project with over 400 scientists from 25 institutions in 7 countries, who have come together to carry out the survey. Our team of scientists comprises university faculty and researchers, laboratory and observatory staff scientists, post-doctoral researchers, and graduate and undergraduate students. The support staff are also a critical part of the team: they make it possible for our scientists to travel to Chile to observe for the survey and to travel to conferences and collaboration meetings to discuss the latest results. The Science Committee is coordinated by Scott Dodelson & Elisabeth Krause. 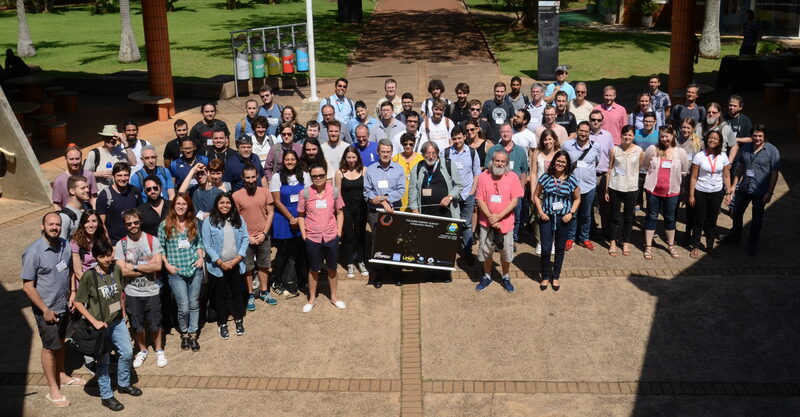 We also collaborate with other scientists and projects to carry out joint studies including the Atacama Cosmology Telescope, VISTA Hemisphere Survey, the South Pole Telescope Survey, STRIDES, and others. At each institution, a number of scientists share their knowledge of the cosmos and their perspectives on science with the general public. DES is committed to contributing to both our local communities and the global community. DES welcomes new ideas for external collaboration – if you are interested, please contact one of the working group coordinators or analysis team leads listed above. The collaborating institutions and their countries or regions are listed below. Funding for the DES Project has been provided by the U.S. Department of Energy, the U.S. National Science Foundation, the Ministry of Science and Education of Spain, the Science and Technology Facilities Council of the United Kingdom, the Higher Education Funding Council for England, the National Center for Supercomputing Applications at the University of Illinois at Urbana-Champaign, the Kavli Institute of Cosmological Physics at the University of Chicago, Financiadora de Estudos e Projetos, Fundação Carlos Chagas Filho de Amparo à Pesquisa do Estado do Rio de Janeiro, Conselho Nacional de Desenvolvimento Científico e Tecnológico and the Ministério da Ciência e Tecnologia and the Collaborating Institutions in the Dark Energy Survey.